SAN FRANCISCO (AP) Bruce Bochy has long been a manager who makes it all about his players, the men he writes into the lineup day after day, game after game, month after month. That's a big reason San Francisco's veteran, likely Hall of Fame skipper, decided in February to make it public he will retire at the end of this season. He grew tired of the constant questions, the regular speculation about his future. He didn't want to be a distraction. Now, the Giants will begin a new season that is Bochy's last - and everyone involved is determined to make it memorable despite the daunting task of returning to winning in the loaded NL West. "It's a gut feeling that it's time," Bochy said early in spring training. "It's been an unbelievable ride. There's so much that I have to be grateful for, with the players, the city, the fans, my ride here. It's time." In Bochy's first season with the Giants in 2007, he managed Barry Bonds when the slugger broke Hank Aaron's home run record. Bochy then guided the Giants to World Series championships in 2010, `12 and `14 but San Francisco has largely struggled since that remarkable run. The club reached the 2016 NL division series and lost to the Cubs in four games. "We have this year to take care of first. Hopefully we will make it a memorable one for him," shortstop Brandon Crawford said. "But it will definitely be different without him." Some of San Francisco's biggest stars missed significant time in 2018 with injuries yet again: ace lefty Madison Bumgarner, right-handers Johnny Cueto and Jeff Samardzija, catcher Buster Posey, first baseman Brandon Belt, second baseman Joe Panik, third baseman Pablo Sandoval. The Giants wound up 73-89, including a majors-worst 5-21 in September, yet bettered their last-place 2017 finish of 64-98. "It's so rare that you see teams just win forever," Bumgarner said. "There's ups and downs in this game all the time and that doesn't mean we're OK with them but at the same time you have to understand that side and hopefully we can speed up the process tremendously to get back to the top and winning side as opposed to the bottom, where we've been the last few years. I don't mean the top or bottom, I just mean the ups and downs." That's Farhan Zaidi's plan, too. The club's new president of baseball operations hopes to take significant steps in 2019 toward getting back into the mix of contention. He is coming from the rival Dodgers, winners of the last six NL West titles. FOCUSED MADBUM: Bumgarner insists he is never one to live in the past. So, the frustrations of his past two injury-shortened seasons are hardly on his mind. But the 2014 World Series MVP sure would like to return to the 200-inning pitcher he has been when healthy. Last year, he knows, was purely bad luck. Bumgarner broke the pinkie on his pitching hand when he was hit by a line drive from Kansas City's Whit Merrifield in his final 2018 spring training start, undergoing surgery to insert pins into the finger. He returned in June and wound up 6-7 with a 3.26 ERA in 21 starts and 129 2/3 innings. In 2017, he missed nearly three months after an April dirt bike accident during an off day in Colorado. HEALTHY POSEY: The Giants want to protect Posey, who underwent season-ending right hip surgery in late August. Posey can't wait to be a regular in the lineup again. "Hopefully the plan that is put forth by the training staff will have you right where you need to be," he said. He hit .284 with five home runs and 41 RBIs in 2018 while limited to 105 games before the operation on his troublesome hip, which needed repair for a torn labrum as well as removal of an impingement. San Francisco signed Stephen Vogt and Rene Rivera to minor league deals. OUTFIELD QUESTIONS: Zaidi wanted to make an offseason splash in the outfield. The Giants were in on new Phillies star Bryce Harper, making him a $310 million, 12-year offer. San Francisco signed Cameron Maybin - who was arrested on suspicion of DUI during spring training - and Gerardo Parra to minor league contracts. 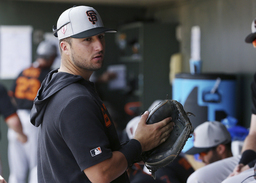 PROSPECT WATCH: Catcher Joey Bart has already made quite an impression in his first big league spring training. The second overall pick in last year's draft, he got to catch Bumgarner's first spring bullpen session. With Bart initially expected to play mostly at Class-A San Jose, Giants fans will have an easy time keeping track of the top prospect with him right in the Bay Area. BOCHY'S PATH: Bochy - an almost certain Hall of Fame selection - plans to stay in baseball once he is through managing, yet what that job will be is unclear.